One of the biggest perks of the job for lots of booksellers is the fact that we got advance copies of books. It's a feeling of wonder to be able to read a book before it is actually available to the general public. Yet it is also a double-edged sword. We need to read these books so we can talk about them when they do become available. It does, however, sometimes make the question of: "What are you reading/loving right now" more difficult. It can seem snobby or aloof to discuss a book that we can't actually sell yet. Right now, I'm dealing with this very scenario. 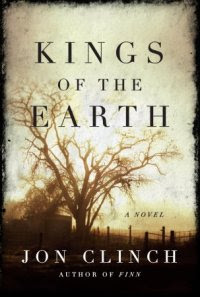 Last week I got an advance copy of Jon Clinch's "Kings of the Earth" in the mail. The book isn't due into stores until July 6, 2010 so it seems a little foolish to talk about it right now. In any case, I'm going to do so with a couple bonus hooks. First, several of us here loved his first novel, "Finn." It's dangerous ground to take on such a mythical and beloved book or character. Clinch used his debut book to look at Huck's father and how historical fiction can both stay true to an original story and re-create it at the same time. "Kings of the Earth" does something similar--though not in dealing with a treasured novel--but rather using the story of a real family and jumping off from there. The Ward brothers were a fairly well-known, if misunderstood, family in Munnsville, NY. Delbert, Roscoe, Lyman and Bill were life-long farmers and were left to their own, simple, devices, until Bill died. Then the story gets really bizarre. A fine quasi-documentary called "Brother's Keeper" was done in 1992. It is a moving portrait of family and of what kind of lives exist outside the cultural norm. The fictionalized family portrait is something I'm excited to sell. The movie is something I wish I would have seen long ago.